Bring a touch of Colonial to your home with this hanging Wall Cup Shelf. This black cabinet is a great storage option in a bath, hall or bedroom. Made of solid wood in the USA. No particle board! 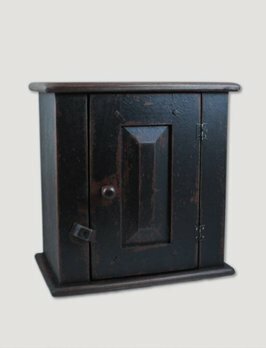 A perfect keeping place for important items this Hanging Black Cupboard is a piece of Colonial traditions from a time gone by. From the workshop of Kenneth James this small cupboard will become an heirloom for generations in your family! NEW ARRIVAL from the beautiful state of Maine! 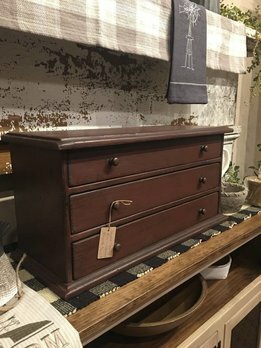 The black Wooden Sewing Box is a timeless addition to your traditional home. Can be used for sewing or many other purposes. Made of solid wood with 3 drawers in the USA. NEW ARRIVAL! The burgundy Wooden Sewing Box is a beautiful addition to your traditional home. Can be used for sewing, in a kitchen or a living room. 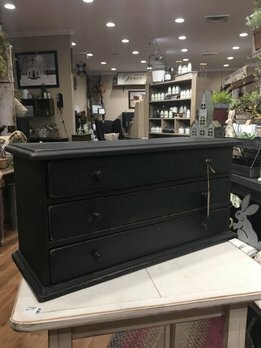 Made of solid wood with 3 drawers in Maine, USA. This Windsor Candlestand Side Table is unique because it is built like it was two hundred years ago at the hands of Lawrence Crouse and his son, Abe. Look at their beautiful finish! Pick from two heights. Please call store for delivery instructions. This Windsor Candlestand Side Table with a 24" top is built like it would have been two hundred years ago at the hands of Lawrence Crouse & son, Abe. Look at their beautiful finish! Pick from two heights. Please call store for delivery instructions. Early American furniture doesn't get better than this Round Top Shaker Table from the workshop of Kenneth David James. From the quality of the wood he chooses to his beautiful finishes this table will become an heirloom for generations to come! Early American furniture doesn't get better than this Queen Anne Black Porringer Table from the workshop of Kenneth James. With it's Porringer style top & beveled edge you'll love the quality of Ken's beautiful finish on this heirloom piece! The British Bookcase is a true classic. With the old world black finish & the cream beadboard back this will be a center piece in your home. 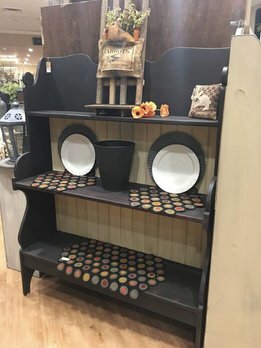 The craftsman also added a notch on each shelf to display your favorite plates! Made of solid wood in the USA!